British Special Forces Acquire Ospreys? The American-built Osprey employs a set of proprotors that can rotate to transition from hovering to fast forward flight. 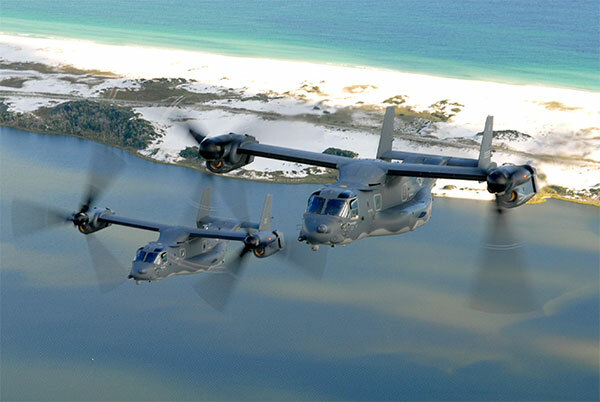 In essence, the Osprey can operate as both a helicopter and turboprop aircraft. 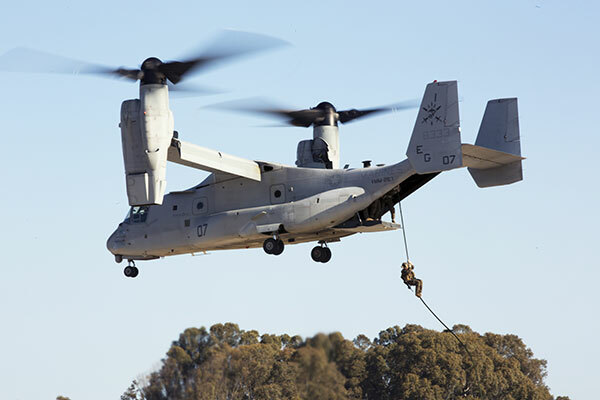 The Osprey out performs other airframes such as the Chinook in terms of range and speed. It has a combat radius of 426 miles, compared to the Chinook's 231 and a top speed of 351 mph compared to the Chinook's 196. The Times reports that the 22nd Special Air Service (SAS) is training with the V-22 Ospreys for the counter terrorism role. The aircraft's speed means it could deliver a UKSF counter terrorism team anywhere in the U.K. in a much more timely fashion than the Chinook or Dauphin helicopters currently used. It's understood that the SAS has units forward-deployed in London to respond to an attack in the capital but if needed, it would only take the Osprey around 30 minutes to bring in reinforcements. While a very capable aircraft, the Osprey has not been without controversy, especially regarding its safety record. A series of Osprey crashes have killed 36 U.S. servicemen. Defenders of the aircraft note that these incidents mostly happened early on in the Osprey's development and all were the result of pilot error. Both the U.S. Air Force and Marine Corps fly the Osprey. It is not clear at this time how many Ospreys have been 'acquired' (if any have been at all ). Neither is it clear if they have been bought or merely leased from the Americans. It had previously been reported that, following the Strategic Defence & Security Review, 2015, the UK were planning to upgrade the range and capabilities of aircraft tasked with special operations. This included looking at in-flight refueling for helicopters, increasing fuel capacity and, the possible acquisition of new aircraft types, including the V-22 Osprey. As is typical for the U.K. press reporting on Special Forces matters, it can not be assumed that this story is completely accurate. It may well be that the SAS has been training with the Osprey, possibly with the help of the Americans. The USAF's 7th Special Operations Squadron (7th SOS) , based at RAF Mildenhall operates the CV-22B Osprey. The press may have gotten wind of some joint training between the SAS and the 7th SOS and assumed that a UK Osprey acquisition was imminent. It may be that UKSF wanted to get some hands on experience with the aircraft type in order to evaluate it as a possible future procurement. If the MoD was to buy even a small number of Ospreys, it would be a major undertaking, with significant costs, not just for the aircraft themselves at £43 million each, but also for the supporting elements such as ground crew, training, maintenance etc. Press reports indicate that British pilots are undergoing training in the United States, although this may be a reference to exchange programs not linked to any planned aircraft acquisition. In the event that Ospreys were acquired, it remains unclear which unit would operate them. It may be speculated that the task would fall to 7 Squadron, RAF, perhaps freeing up a number of Chinooks for the Support Helicopter Force in the process. While the press reports revealing the Osprey focus on the domestic counter terrorism role, the Osprey's range and speed also make it suitable for more general special operations support tasks. The U.S. Air Force, for example, use the CV-22B variant for special operations missions (pictured below). CV-22B Osprey missions have included deploying U.S. Army Delta Force teams into Syria. A pair of United States Air Force (USAF) CV-22 Ospreys pictured in forward-flight configuration. When in this mode of flight, the Osprey flies nearly as fast as a C-130 Hercules. The CV-22B features extra wing fuel tanks, a terrain-following radar and a suite of sophisticated defensive counter measures and mission systems. U.S. Marines fast-rope from a hovering MV-22B Osprey. The Mail reports that SAS have abseiled from a V-22 Osprey onto a building during a counter terrorism exercise. While the Osprey would arrive on scene quicker than a Chinook would, it can only carry 24 troops - much less than a Chinook.